Immortality is a by-product of good work. 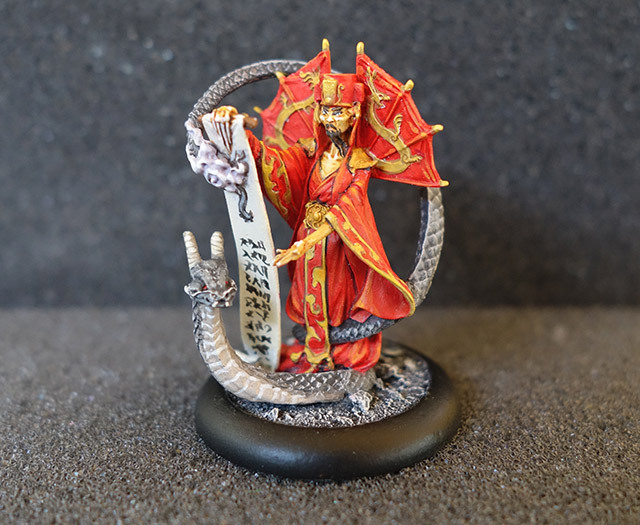 Cheng Xiao-Chen, officer figure in the Hell Dorado Immortals Starter Set. Cheng Xiao-Chen, Imperial Bureaucrat, has the ability to slow units with the Breath of the Dragon aura, and bless or curse them with the Blessings of the Dragon or Curse of the Dragon spells. He also has a nice order called Spiritual Interference that can, once per game, cause the enemy to lose all of his Command points. 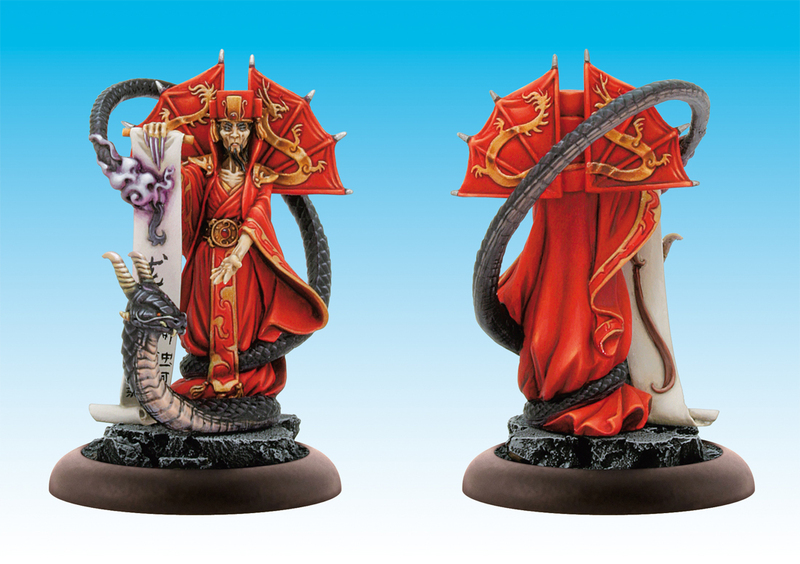 He’s a somewhat fiddly figure to put together, with the body of the dragon snake curling around behind his body, and the two ‘wings’ of his robe attached to his shoulders. I’ve recently been having some success with using little bits of ‘green stuff’ molding putty as well as super glue when putting figures together—it gives the pieces a good bond while the glue is drying, though be careful to use just the tiniest amount. Painting him was tricky too, with the very detailed yellow-gold traceries on his robes, some hard-to-reach areas, and my dodgy pseudo-calligraphy on the scroll. 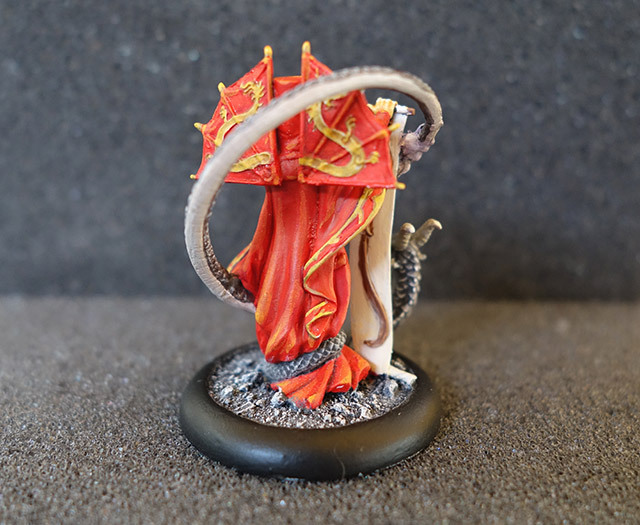 Painting figures like this gives me new respect for the professional painters who created the commercial display jobs on these figures; the detail in this one is extraordinary, for example, and puts my work to shame—have a look at it here. So, we’ve finally come to the end of the Demons and Immortals starter sets for Hell Dorado, save for a couple of lemures, which I’ll showcase as a group with some other lemures I’ve bought since. Of course I’ve already got a few more figures bought and in various stages of painting, which I’ll be showing off in future articles. Currently I’m happy with 200 or so points of Demons, Immortals and Westerners (and a couple of officer choices per faction), and have vowed not to buy any more figures in this range until those are all painted and I’ve played a few games. Oh, I forgot to mention. There’s a new Hell Dorado podcast up and running called Total Command, who kindly mention my summary sheets in their latest episode. Nice to see this game getting some coverage—though, frustratingly, I still haven’t had a chance to actually play it!